It's good time to be creative! By April this year - and this is no April-fool joke - you could be RM18,000 richer. Harbour Mall Sandakan is inviting all Malaysians - school students, undergraduates from design and art discipline from government or private universities and colleges, and individuals - to submit their design of an iconic sculpture that will best represent Sandakan to the world. The best design will be 'brought to life' in the form of a sculpture that will eventually be placed at Sandakan Harbour Square, the Nature City's latest public landmark. 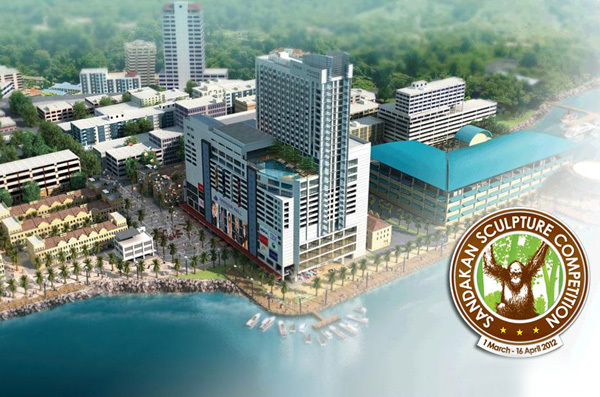 Contestants for the Sandakan Sculpture Competition 2012 must be Malaysian citizens. Only ONE entry per person will be accepted. Contestants must submit an Official Entry Form and ONE idea (in 2D or 3D sketches, plans, sections, elevation or perspectives; 3D modelling with photo submission; etc) that best illustrates their design intent. Each design must be accompanied by its rationale, in not more than 80 words. Submission can be done online, by post or by hand. Online submission must be attached with high resolution JPEG or PDF files in not more than 3 MB each. Physical submission must be in A3 size, between 1 to 5 drawings. Competition period is from Thursday, 1st March to Monday, 16th April 2012. All entries must reach the Organiser latest by Monday, 16th April 2012 at 12.00 noon. During the early 1870s, the east coast of Sabah was under control of the Sultan of Sulu, who also ruled what is now the southern Philippines. The first European settlement in the area was founded by William Clarke Cowie, a Scottish gun smuggler from Glasgow, who received permission from the Sultan to establish a small trading base. Cowie called his settlement Sandakan, which in Tausug (Sulu) means "the place that was pawned", but it soon came to be known as "Kampung German" after the large number of Germans who also set up posts there. The Japanese occupation of Sandakan during World War II began on 19 January 1942 and lasted until a brigade of the Australian 9th Division liberated it on 19 October 1945. The Japanese administration restored the name Elopura for the town. One of the atrocities of World War II was the Sandakan Death Marches, when Japanese soldiers decided to move about 2,400 prisoners of war in Sandakan 260 km (160 miles) inland to the town of Ranau.